One of the top priorities for today’s activity at the South Adger’s Wharf dig was chasing the northwestward continuation of the brick redan to the point where it connects with the brick curtain wall along East Bay Street. Under the watchful eye of archaeologists Eric Poplin and Ron Anthony, the backhoe scooped out more fill until the top of the redan was seen, and then the shovel work began. 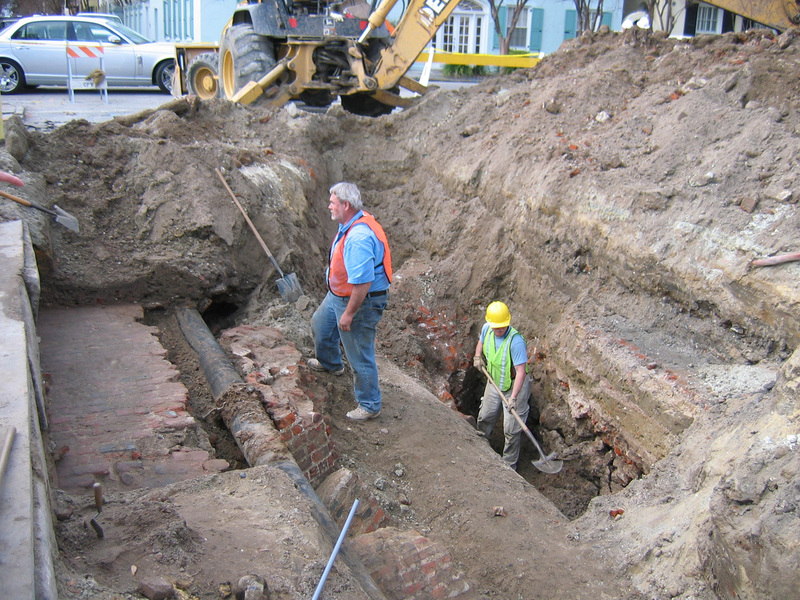 After an hour or so of hand digging, the archaeologists uncovered the continuation of the five-foot wide brick redan. As expected, it lies in a northwest diagonal line, and is located on the northwest side of a four-foot wide brick drain (probably dating from the 1850s) that slices directly through the remnants of the redan. 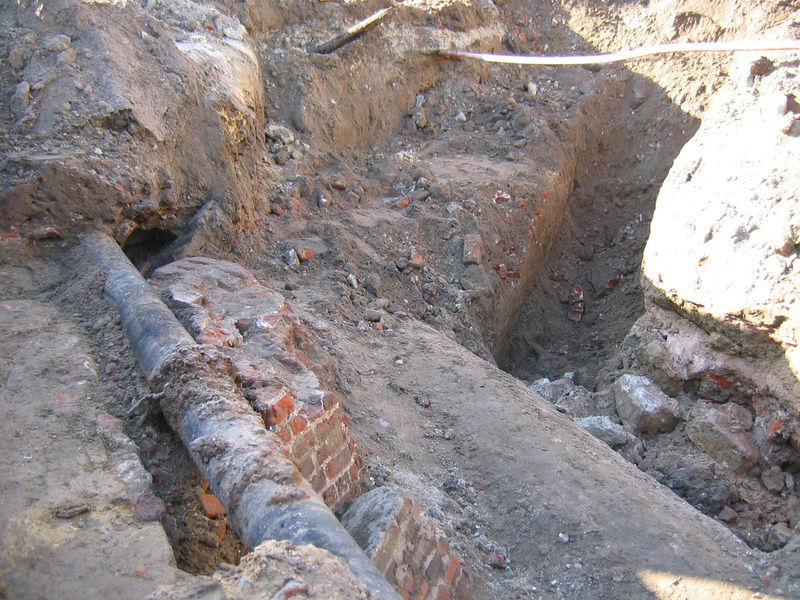 Later in the afternoon, after further fill material was removed, the crew discovered that the continuation of the redan on the northwest side of the brick drain is not quite the same as the portion uncovered earlier. The five-feet-wide wall makes a sudden transition to a four-feet width, and the slight outward slope of the wall disappears. A brief downward probe revealed the presence of a slightly wider footing, and then the resumption of the outward slope. Hmm, very curious! Further digging and three-dimensional sketching will be required to sort out these puzzling characteristics. Two additional factors complicate the picture in the west end of Trench 2. First, there is a large amount of brick rubble just east (i.e., outside) of the redan. Poplin and Anthony don’t seem phased by this rubble—they’re confident that it represents the demolition of the redan in 1785. Second, there is a significant amount of debris representing the extension of the “Lower Market” over the redan fragments in 1786. Archaeologist Martha Zierden is very excited about exploring this material, and soon will be working carefully through the surviving brick floor of the old market and sifting its contents. 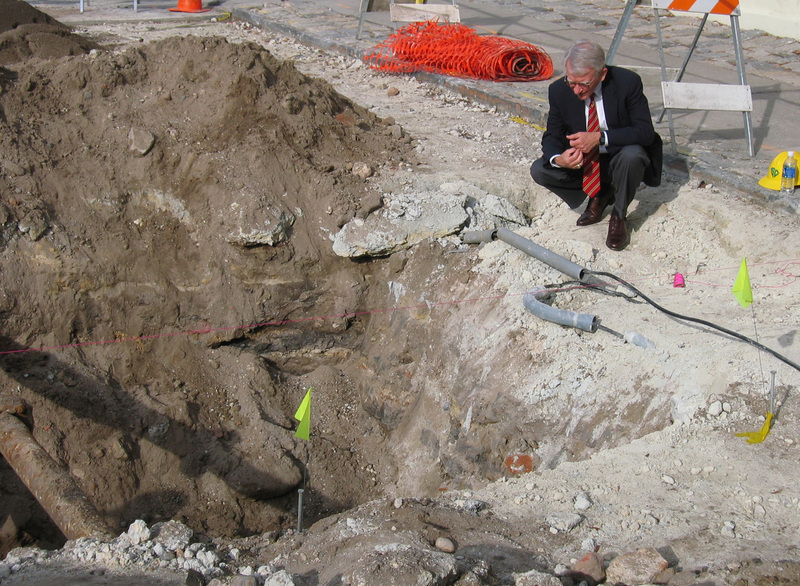 About mid-morning Charleston’s mayor, Joseph P. Riley Jr., paid an executive visit to the site. Katherine Saunders, co-chair of the Walled City Task Force, provided a brief tour, and archaeologist Martha Zierden explained some of the interesting features uncovered so far. 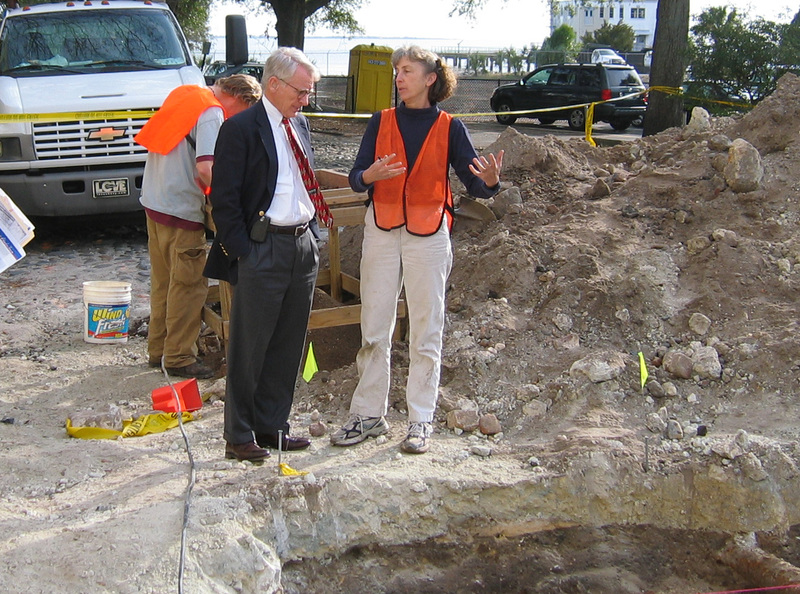 Mayor Riley’s keen interest in Charleston history led to the bulk of the funding for this excavation and we owe him a great debt of gratitude. We certainly hope that the enthusiastic public support for this work and the substantial amount of scientific data recovered at South Adger’s Wharf will be sufficient dividend for the city’s investment. Thanks again to our volunteers, young and old(er)! Without their help we would miss finding so many important bits and pieces of the past that come up in the buckets of dirt. 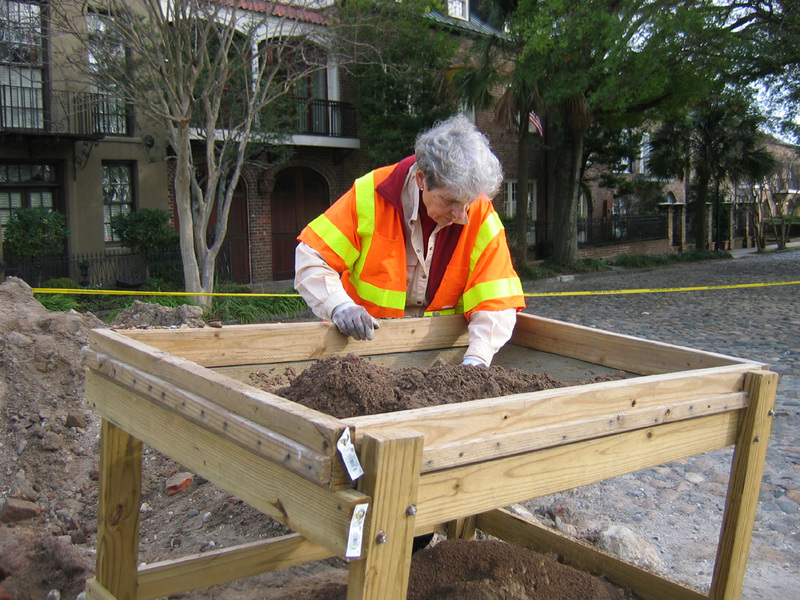 If you’re interested in volunteering or contributing in some form, please contact Katherine Saunders at at (843) 723-3646, or email her at ksaunders[at]historiccharleston.org. We had a great visit to the dig site yesterday, and it even tied in to our lesson on narrative writing. We look forward to keeping up with your blog and many discoveries. Thanks for taking the time to speak with us!